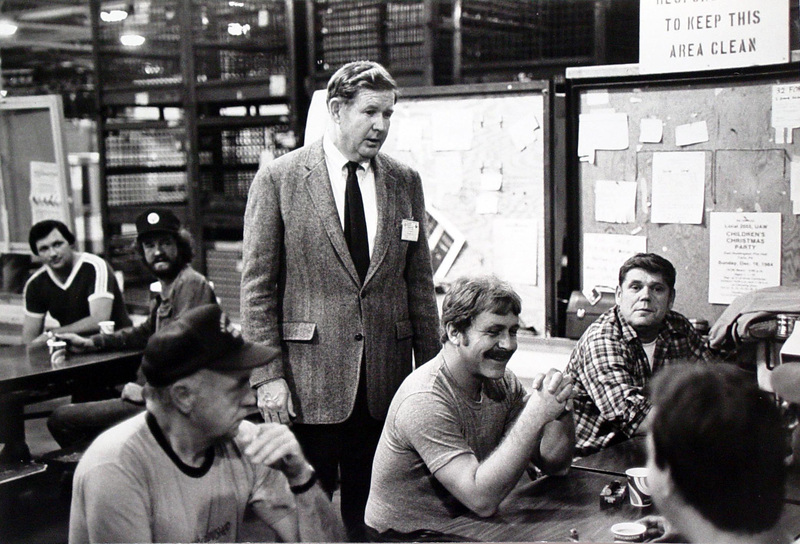 John Murtha visiting Volkswagen plant, 1977. John Murtha accompanying miners, 1978. 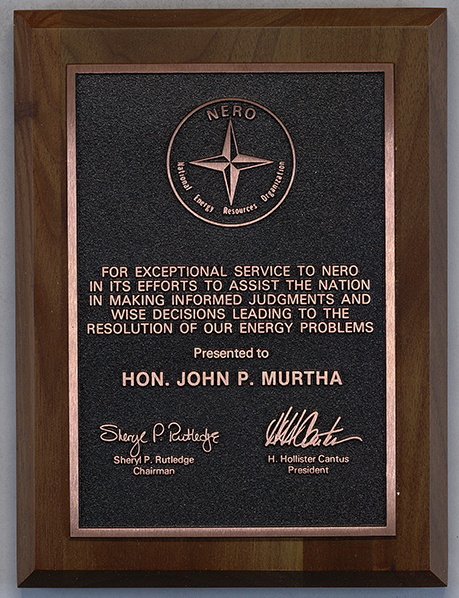 Plaque awarded to John Murtha from the National Energy Resources Organization (NERO), undated. 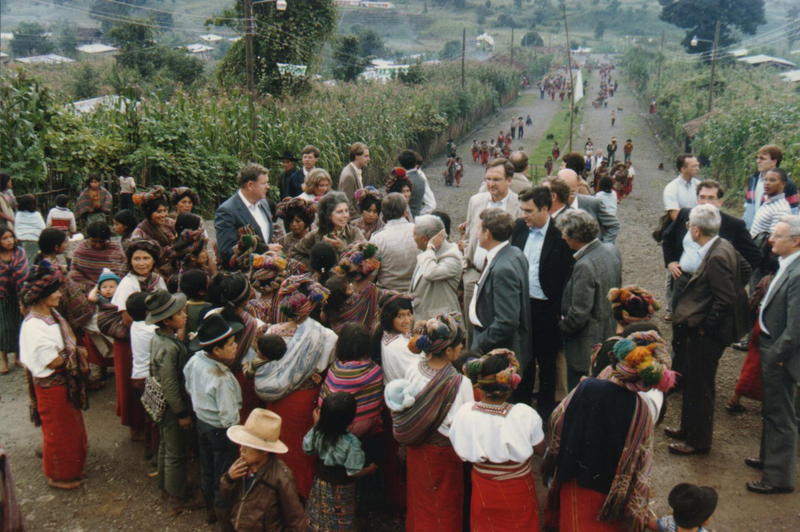 John Murtha, serving as a Congressional Delegate to Guatemala, 1980s. 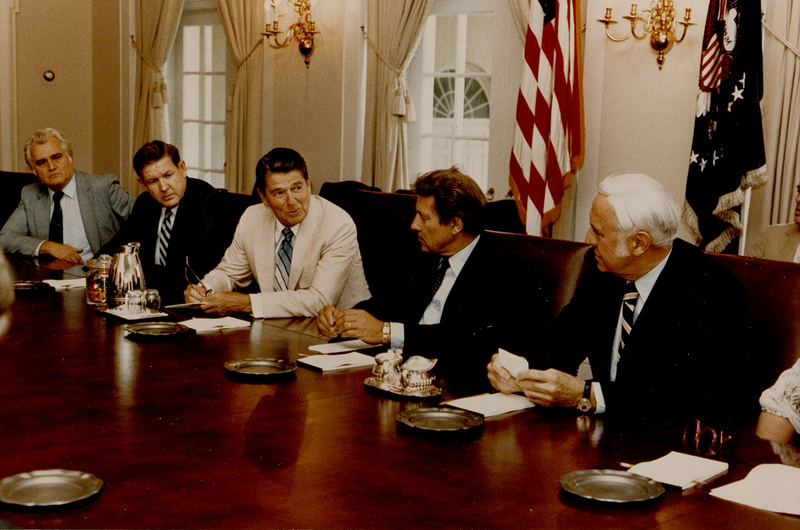 John Murtha with President Ronald Reagan and others signing legislation. c. 1980s. A copy of H.R. 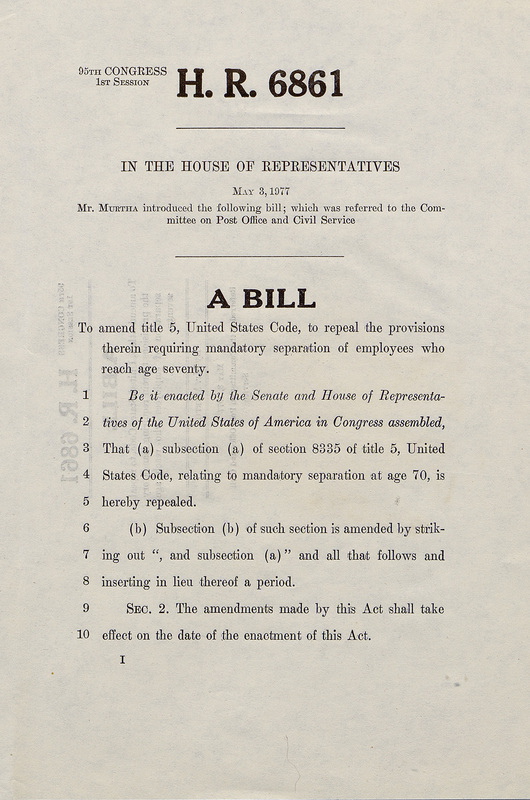 6861, a bill to repeal age discrimination in the workplace. It was introduced by John Murtha in 1977. A copy of H.R. 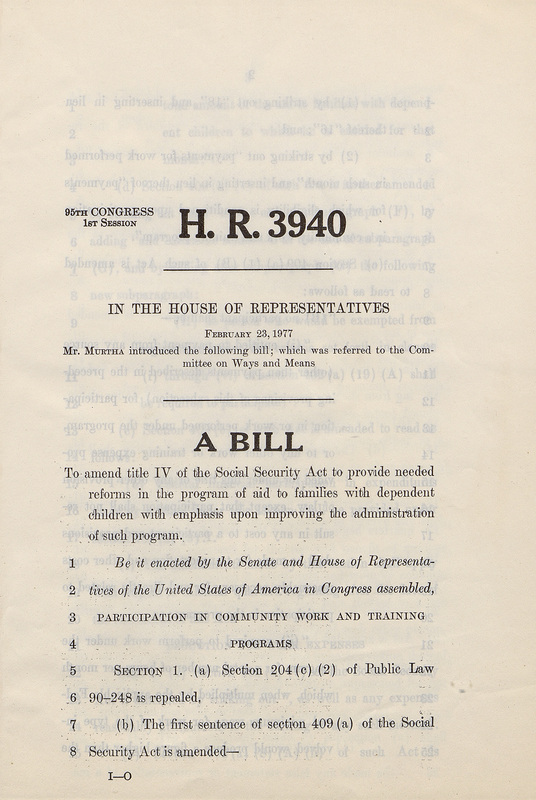 3940, a bill to reform Social Security programs for families with dependent children. It was introduced by John Murtha in 1977. 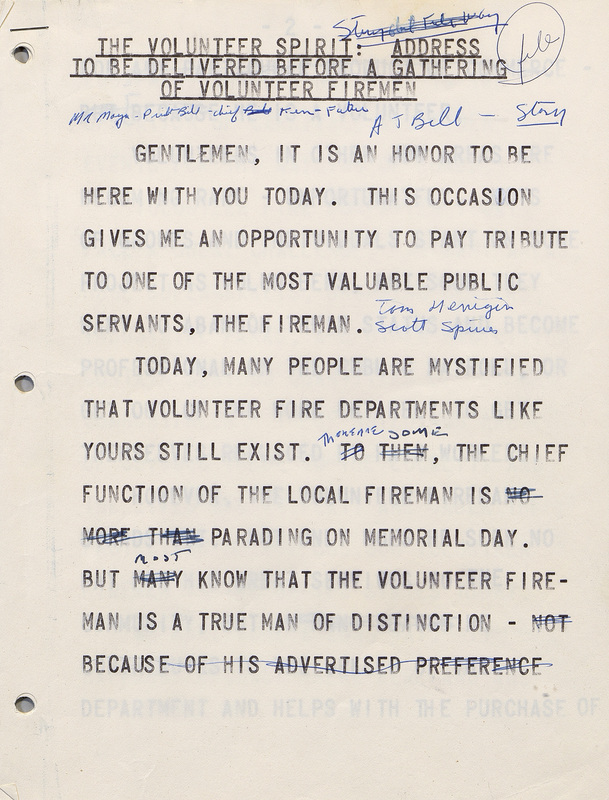 Speech notes from John Murtha's speech to volunteer firemen. 1974. John Murtha speaking at the dedication of the Latrobe and Derry Armory. 2002. 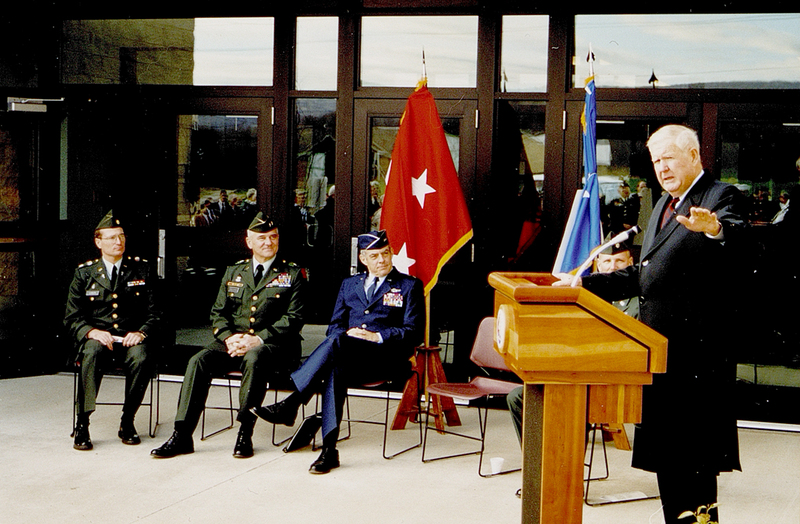 John Murtha speaking at the ribbon cutting for the Army National Guard Armory in Mt. Pleasant. 1999. 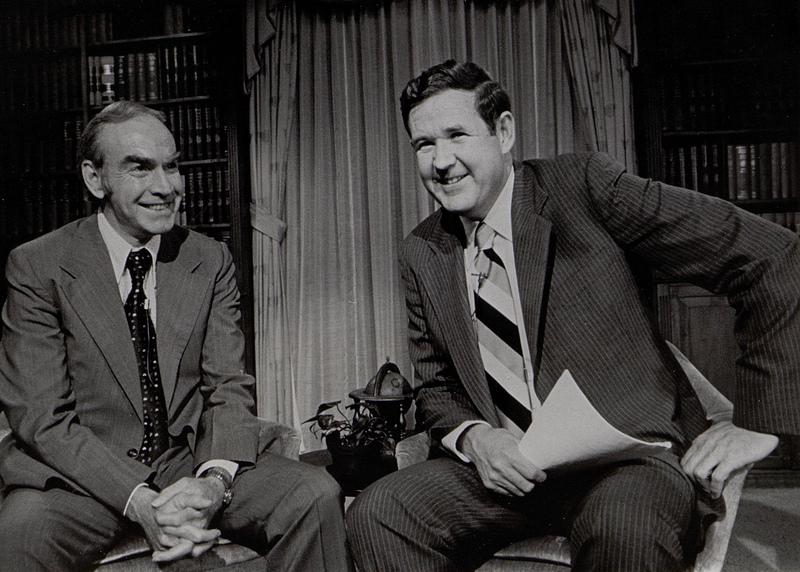 John Murtha with Speaker of the House Jim Wright on Murtha's TV show, Capitol Commentary. 1979. 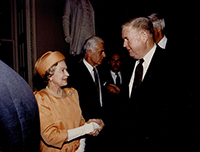 John Murtha and Queen Elizabeth II. 1992. The John P. Murtha Congressional Papers are physically retained in and made available by the Archives Service Center at the University of Pittsburgh. Donated in 2010, the collection’s arrangement and description was completed in 2015. This website highlights some of the strengths of the Murtha Papers and sheds light on the diversity and depth of the content within it. This collection is comprised of 400 boxes of paper materials generated by Murtha and his staff members, which includes everything from newspaper clippings, reports and meeting notes, correspondence, copies of legislation, daily schedules, and even his personal notes. There are also hundreds of photographs and over 1,000 film and audio items in various formats to give visual life to his accomplishments. 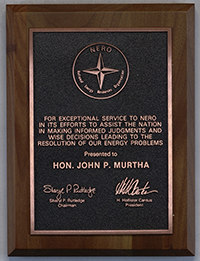 Another significant component of the collection is more than 1,000 objects which were mostly given to Murtha as gifts or awards to honor his various service to the nation. A finding aid was created from the organization of the papers in order to assist researchers in navigating the voluminous content. Explore the finding aid to find out more about the contents of the collection. For any additional questions about the papers or conducting research, please contact the Archives Service Center to learn more. Murtha attended innumerable meetings and was invited to special events and speaking engagements. His appointment books and internal office files reflect his time spent dealing with issues before the House and the 12th District he represented. This information can be found in Series I – Administrative Files within the John P. Murtha Congressional Papers. Murtha wrote and received letters from prominent political and civic figures as well as personal correspondence with friends and family. His detailed travel schedule and trips abroad are also well documented. His efforts to be re-elected to represent the 12th Congressional District in Pennsylvania comprise a portion of this grouping. Drafts of Murtha's memoir From Vietnam To 9/11: On the Front Lines of National Security (2003) can also be found here. This information can be found in Series II – Personal and Political Files within the John P. Murtha Congressional Papers. Murtha proved his dedication to the people and interests of Johnstown time and time again as their representative in the US Congress. Throughout his time in Congress, he sponsored and introduced many pieces of legislation that would work to benefit the people of his district and better it as a whole. Murtha sponsored several bills to improve Pennsylvania infrastructure, including expanding Pennsylvania highways and helping volunteer firemen by lessening the costs of uniforms and fuel through tax breaks. 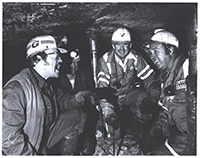 He introduced bills to amend the Health Act of 1969 to protect coal miners and a second to help victims of the 1977 Johnstown Flood using proposed grants from the government. In 1986, he introduced a bill that would increase funding for the Allegheny Portage Railroad National Historic Site and the Johnstown Flood National Memorial. Over the course of his political career, Murtha sponsored 218 pieces of legislation. 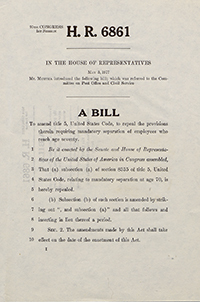 Murtha focused much of his legislation on supporting the Armed Forces and National Security, an area in which he sponsored 22 pieces of legislation. Other areas of focus include Taxation and Foreign Trade and International Finance, with 21 and 18 sponsored pieces of legislation introduced, respectively. Murtha also sponsored legislation in the areas of Transportation and Public Works, Social Welfare, Crime and Law Enforcement, Health, and Labor and Employment among others. 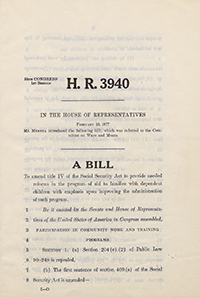 Information regarding legislation sponsored and cosponsored by Murtha, including copies of the legislation themselves, can be found in Series III – Legislative Files within the John P. Murtha Congressional Papers. As a U.S. Congressman, Murtha was a public figure who expressed his opinion to the media and sought to promote the needs and accomplishments of his district. Within the collection can be found news clippings and press releases documenting the work of his two press secretaries, William Allen and Brad Clemenson. Additionally, there is a significant amount of scrapbooks which are compilations of press articles relating to Murtha and projects while in Congress. 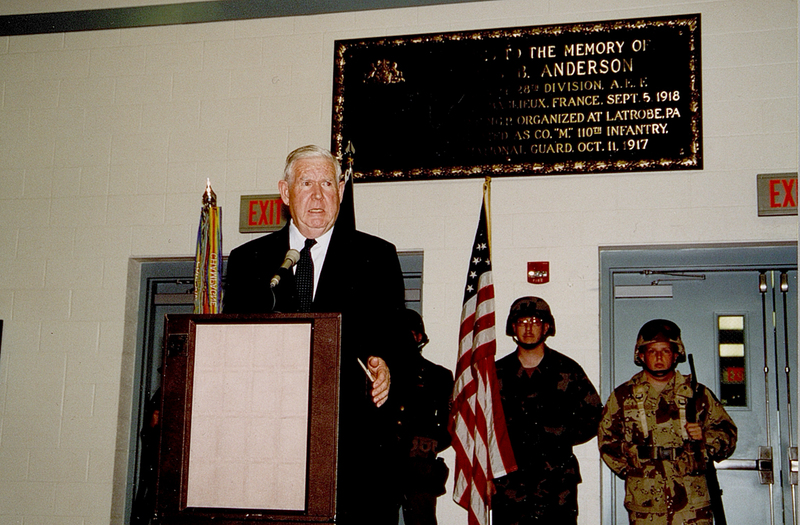 Throughout the course of his career, Murtha gave many speeches and remarks at various events. He spoke at community events around his district, such as celebrations, conventions, and building dedication ceremonies. He spoke at the New Growth Arts Festival (1978), Central Pennsylvania Fireman's Convention (1974), and the Windber Community Building Dedication (1974). He also spoke at events for organizations within the 12th District, such as the Johnstown Lions Club and the Association of Iron and Steel Engineers (Morgantown, W.Va. and Pittsburgh, Pa.), both in 1984. Murtha gave remarks at commencement addresses for high school and college graduation ceremonies, such as Hollidaysburg Area High School (1975) and St. Vincent College (1983). As an active member of the US House of Representatives, Murtha gave remarks on the floor of the House throughout the 104th – 111th Sessions of Congress. 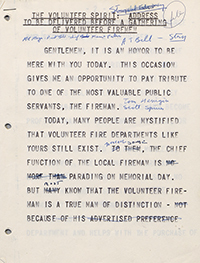 Transcripts of these speeches, selected congressional sections of floor remarks, and more can be found in Series IV, Subseries 4 – Speeches, Statements, and Remarks within the John P. Murtha Congressional Papers. Murtha was involved in countless projects within the 12th District. The collection comprises hundreds of folders documenting county projects and subject files. The files of Project Managers John Hugya and Bard Clemenson demonstrate how important the projects that developed in the 12th District were to Murtha. This information can be found in Series V – Project Files within the John P. Murtha Congressional Papers. As an outspoken military veteran, Murtha received thousands of letters from those who approved or disapproved of his stance on the Iraq War. In November 2005, Murtha spoke at a press conference against the war, calling it "a policy wrapped in illusion." As a result of his statement, he received a great deal of mail and media attention reflecting the opinions of the nation and his constituents on the conflict and occupation. This information can be found in Series VI – Iraq War Response within the John P. Murtha Congressional Papers. Murtha’s personal and political activities were well documented in still images, sound recordings, film and video. Photographs depict Murtha meeting with presidents, attending events, and meeting people of the 12th district; they also visually document his trips abroad, interactions with dignitaries, and many other events and occasions. Interviews, campaign spots, and Murtha’s own television show “Capitol Commentary” are captured on film and in sound recordings. These materials can be found in Series VII – Audio-Visual Material within the John P. Murtha Congressional Papers. As a long-time member of the US Congress, Murtha received countless letters from his constituents as well as those outside his district. A sampling of correspondence over his 36-year career preserve the voices of the 12th district and touch on topics including energy, labor, the environment, employment, healthcare, defense, and the welfare of veterans among others. These materials can be found in Series IX – Constituent Correspondence within the John P. Murtha Congressional Papers.